The retailer says it wants to remove the "friction" of buying digital content, by making it as easy as picking a game off a shelf. Game retailer GameStop is hoping to expand its role in selling DLC by becoming a bridge between the consumer and Xbox Live or PSN. Shawn Freeman, SVP and GM of GameStop's digital business, said that a lot of customers still gravitated towards retail, and that by partnering with retailers, publishers could increase the reach of their digital content. The plan is a pretty simple one: Consumers tie their Xbox Live or PSN profiles to their GameStop accounts so when they buy content in-store, it's already in their download queue when they get home. Freeman said that the plan would remove some of the "friction" of buying online. Customers wouldn't have to go home, buy points, and then buy the content, he explained, instead, they could treat it just like a regular purchase. He admitted that the plan would mean less money per sale for publishers, but said that it would ultimately increase their revenue by generating more sales. 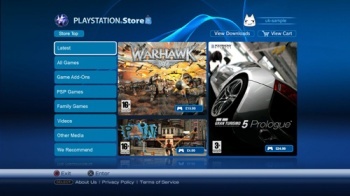 Freeman noted that GameStop sold as many points for Xbox Live and PSN - in the form of prepaid cards - as Microsoft and Sony did online, which he said demonstrated just how much access GameStop had to gamers who were interested in downloadable content. Some people may balk at the idea of GameStop knowing who they are on XBL or PSN, but the idea itself sounds pretty convenient. Freeman says that GameStop has already approached a number of potential partners for the idea, so perhaps we'll see it rolled out in the not-too-distant future.